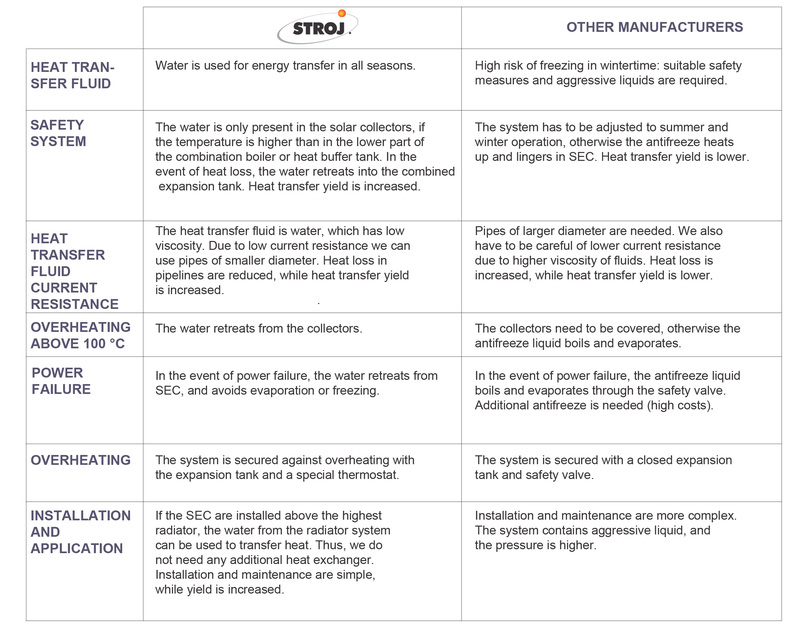 Combined solar heating for indoor spaces and domestic hot water - Stroj-energijska tehnika d.o.o. The system for central heating and domestic hot water heating includes a combination furnace with one or two separate combustion chambers, with the possibility of a simple heat-exchange cartridge installation, with an immersed heat storage tank – water heater for domestic hot water, a system of solar panels, and relevant links to connect the open central heating system. The heart of the system for combined heating is the combination furnace with one or two combustion chambers. 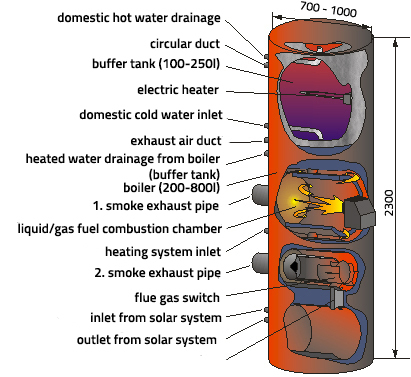 The combustion chamber has a cylindrical shape, which allows for lower fuel consumption, better abstraction of heat, and high endurance at any pressure. 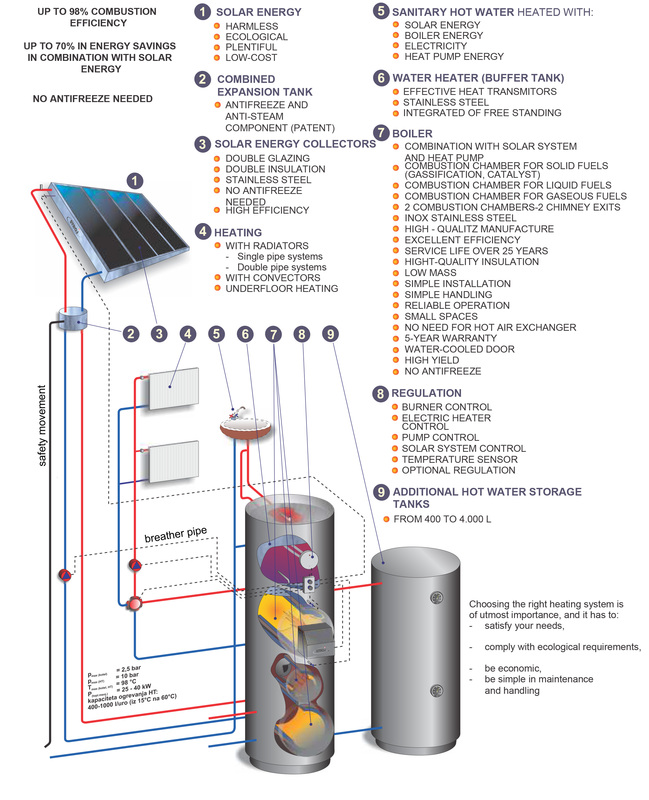 Through pipe distribution, the furnace is connected to the solar collectors and the STROJ combined expansion tank with a pressure equalising conduit. 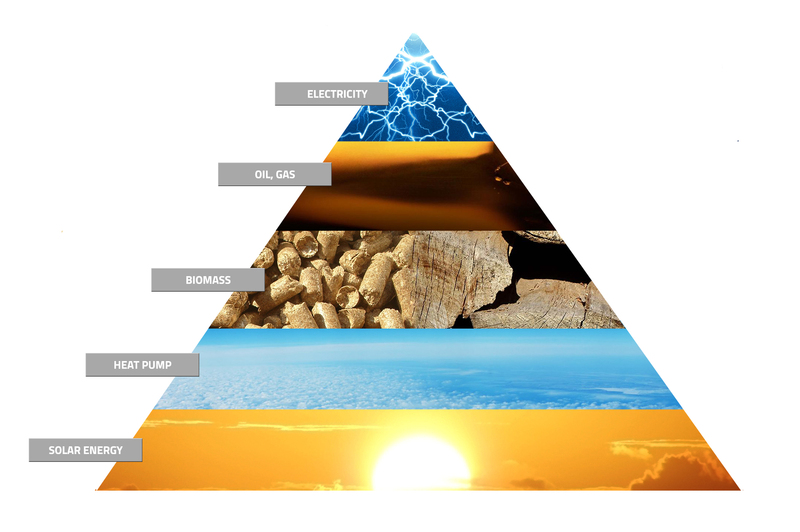 The harvested solar energy is used first – the heat exchanger powered by the sun is located at the lowest point of the furnace. 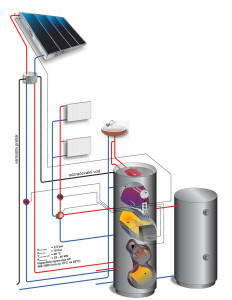 Domestic hot water heating in the buffer tank (boiler) with electricity. The furnace automatically adjusts the heating mode, and takes full advantage of solar energy, both in winter and summer.When the water at the bottom (the solar portion of the stove) is sufficiently heated, the natural law of physics dictates that it flows upwards, and begins to heat the radiator water and the domestic hot water in the water heater (indirectly). When the lower “solar water” is sufficiently heated, the burner automatically shuts down. If solar energy does not generate enough power, the burner automatically switches on. When the water at the bottom (the solar portion of the stove) is sufficiently heated, the natural law of physics dictates that it flows upwards, and begins to heat the radiator water and the domestic hot water in the water heater (indirectly). When the lower “solar water” is sufficiently heated, the burner automatically shuts down. If solar energy does not generate enough power, the burner automatically switches on.